Bangkok Mass Transit Authority (Thai: องค์การขนส่งมวลชนกรุงเทพ), also known as BMTA (Thai: ขสมก. ), is the main operator of public transit buses within Greater Bangkok area. It is the largest city bus system in Thailand. The Bangkok Mass Transit Authority offers bus and van routes throughout the city and its suburban provinces. The BMTA is a state enterprise that started operations on October 1, 1976 upon the purchase and combination of the transportation assets of private bus companies, most of which had faced crisis due to sharply rising oil price since 1973. The government, in 1975, solved the crisis by trying to set up a public-private joint venture called the Metropolitan Transit Company, Limited (Thai: บริษัทมหานครขนส่ง จำกัด), but the effort failed to materialize. It tried again in 1976 by setting up BMTA as a fully state-own enterprise under the control of the Ministry of Transport and Communications. Since then, the organization has been the main operator of city buses. However, some private bus companies opted to continue their service on certain routes under joint service contracts with BMTA instead of selling their assets to the state. Despite government subsidy, BMTA has been suffering a loss of profits from day one, resulting in deteriorating quality of service. 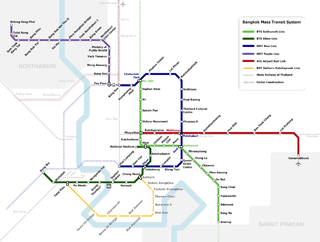 The BMTA service area covers Bangkok Metropolis and its suburban areas in the adjacent provinces of Nonthaburi, Samut Prakan, Pathum Thani, Nakhon Pathom, and Samut Sakhon. It serves approximately 3 million passengers per day. The service hours are 05.00-23.00 hrs, except 24-hr night-owl service on some routes. In September 2005, BMTA owns a fleet of 3,579 buses—comprising 1,674 ordinary buses and 1,905 air-conditioned buses. In addition to BMTA-owned buses, there are 3,485 private-own contract buses, 1,113 contract minibuses, 2,161 side-street songthaews, and 5,519 vans. In total, there are 15,857 buses and vans over 427 routes across 8 zones. The BMTA allows riders to board a bus and pays with cash or coupons. In the near future, the government will implement the common ticketing system across all mass transit modes, allowing passengers to pay with a single smart card. Conductor on the bus walks back and forth to collect fare from passengers. The fare varies as distance traveled, type of buses, and type of services. Monks and postal workers on duty are exempt from paying fare. Fifty-percent discount is given to the blind, military and police officers in uniform, decorated veterans, and senior citizens. Students with pre-purchased passes also pay discount fare. Passengers can purchase coupons with discount at BMTA headquarter and branch offices. These coupons can be used as fare payment at face value on the bus. BMTA operates air-conditioned and ordinary buses from various makers, most of which are Japanese. The air-conditioned bus fleet consists of buses from Hino, Isuzu, Daewoo, Mercedes-Benz (standard and articulated), MAN SE, Ikarus Bus (articulated bus only), and Scania. The ordinary bus fleet consists of buses from Hino, Isuzu, Daewoo, and Mitsubishi Fuso. However, the ordinary buses are being phased out. Most of the buses run on diesel, but they are being converted to cleaner and cheaper natural gas (NGV) engine. Recently, it operates new routes of NGV-powered air-conditioned vans, shuttling people between city center and suburban communities. Newer double deckers which is MAN Lion's City DD will also be ordered in 2014 and delivered.